Mr. Gilder is an accomplished best-selling author and futurist. Gilder will challenge COFES attendees with new ideas and their application to the engineering software arena. The COFES Institute is pleased to announce venture capitalist and best-selling author, George Gilder, as a keynote speaker at COFES 2018 in Scottsdale, Arizona, April 12-15, 2018 at the Scottsdale Plaza Resort. Mr. Gilder will be a featured keynote speaker on Saturday. This year at COFES 2018, the theme will be Human-Aided Design: Changing the Relationship between Our Tools and Us. To request an invitation, visit apply.cofes.com. The annual four-day event for the design and engineering software industry brings together a diverse group of thought leaders in technology and science to engage in wide-ranging and meaningful discussions. At COFES 2018, Mr. Gilder will be speaking about his forthcoming book, Life After Google, which is due to be published in 2018. The new book examines and discusses the coming profound shift in the global technological and business landscape being ushered in by blockchain and other emerging technologies. 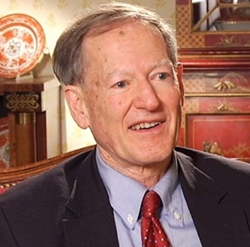 Mr. George Gilder is Chairman of Gilder Publishing LLC, in Great Barrington, Massachusetts, and a founder-fellow of the Discovery Institute in Seattle. He is the author of twenty books on economics and technology including, Wealth and Poverty (1981), The Spirit of Enterprise (1986), Microcosm (1989), Life After Television (1990), Telecosm (2000), The Silicon Eye (2005), and The Israel Test (2009). In the past decade, Gilder has begun revolutionizing the field of economics. In his book, Knowledge and Power (2013), Gilder presents a new economy based on the information theory that enabled the computer revolution and the rise of the Internet. In a review, Steve Forbes stated that the book “will profoundly and positively reshape economics… (and) will rank as one of the most influential works of our era.” The book won the Leonard E. Read prize at FreedomFest in Las Vegas in 2013. Mr. Gilder is a contributing editor of Forbes magazine and a contributor to such publications as the Forbes, Harvard Business Review, The Wall Street Journal, and other publications. He lives in Tyringham, Massachusetts, in the Berkshire Mountains, where he is an active churchman, runner/cross country skier, and with his wife Nini, parent of four children. Now in its 19th year, COFES is the annual, invitation-only event for the design and engineering software industry. Widely recognized as a think-tank event, COFES (cofes.com) gathers design and engineering software leaders (vendors, users, press, and analysts) together to discuss the role engineering technology will play in the future survival and success of business. COFES is renowned for hosting leading keynote visionaries that provide a new perspective to the future of the industry. Apply for an invitation at apply.cofes.com. The COFES Institute was created in 2017 to provide sustainable leadership to COFES. The COFES Institute is a non-profit 501c3 governed by a Board of Directors led by Vincent Caprio. Other members of the board are (in order of last name): Jim Brown: President – TechClarity, Jim Doxey: Product Configuration Manager – Oculus, Nathanael Miller: Aerospace Engineer – NASA Langley Research Center, Jason Preston: Co-Founder – Parnassus Group (DENT), and Rebecca Yeh: Event Director & Secretary – COFES. In addition, the COFES Advisory Board was established to provide industry input to the COFES Board, see the COFES website for a listing of the Advisory Board participants.